Screening, Brief Intervention, and Referral to Treatment (S·BI·RT) in pediatric practices normalizes conversations between youth and healthcare providers about alcohol and other substance use, and supports guidance about healthy behaviors. S·BI·RT also identifies youth ages 12-22 whose current use of addictive substances places them at risk for developing substance use disorders, prompting provider brief intervention and referral for further assessment or treatment before a substance use disorder develops. From May 2014 to June 2017, S·BI·RT was implemented as a standard of care in 23 pediatric practices in three cohorts across 10 organizations in New Hampshire—including academic medical centers and FQHCs—serving over 74,000 youth. 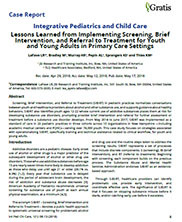 This case study focuses on strategies associated with operationalizing S·BI·RT, specifically training and technical assistance related to clinical workflow, for youth and young adults. Authors: Lea LaFave, Martha Bradley, Adelaide Murray, Amy Pepin, Kara Sprangers, Kathleen Thies.